The Serb moves into his first major semifinal in two years with a spirited display against Kei Nishikori. Novak Djokovic clenched his fists, tilted his head upwards and raised his alarms aloft. The relief was palpable. After agonizing quarterfinal defeats at the French Open and Australian Open this year, Djokovic exercised the demons. He dispatched Kei Nishikori, 6-3, 3-6, 6-2, 6-2, in two hours and 38 minutes in the last eight at Wimbledon and the inner steel that characterized his previous 12 successes at Grand Slam level has reappeared. “I feel great to be in the last four of Grand Slam,” beamed the Serb afterwards. “I have been building on my game and working on the level of tennis that I have been playing in the last few months. Indeed, he was forced both mentally and physically to go the distance against the Japanese, who has exhibited a hitherto unseen level of performance on grass this year. The pair traded breaks of serve in the opening set before Djokovic broke in the seventh game, carving out the opportunity to serve for the set. He duly obliged as the clock ticked just past the half-hour mark. He had a break opportunity as Nishikori opened set two but squandered the chance and the Japanese broke the Serb’s resistance for a 3-1 lead soon after. 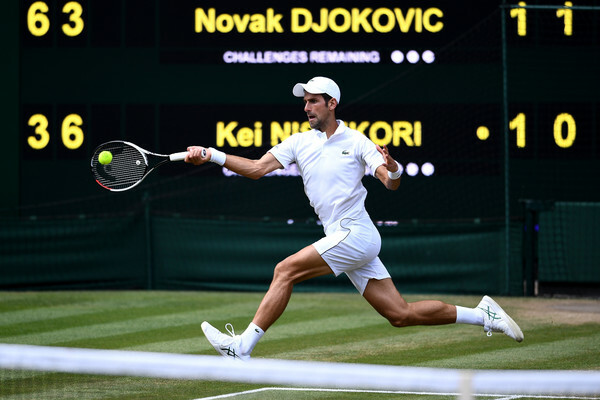 The momentum had shifted in favour of Nishikori and Djokovic, who had a verbal tug-of-war with the Centre Court crowd in his third round clash against Kyle Edmund earlier in the tournament, was going through the motions on court. The umpire Carlos Ramos warned the Serb for racket abuse as Nishikori strolled away with the second set. The third set followed a similar pattern with both players juking with each other until Nishikori blinked first, squandering triple break point in the fifth game before surrendering the first break point he faced in the following game. That dented the Japanese confidence and Djokovic grabbed the double break to seal set three but the inexorable march to victory that many had predicted did not materialize. Nishikori broke to open the fourth frame of the afternoon but immediately relinquished the advantage and Djokovic realized he was in a dog fight. The vital break arrived in fourth game and the Serb consolidated for a 4-1 advantage. He was within touching distance as he held to 30 for a 5-2 buffer and, much like the preceding set, he rammed home his superiority to seal the set – and the match – with a double break.